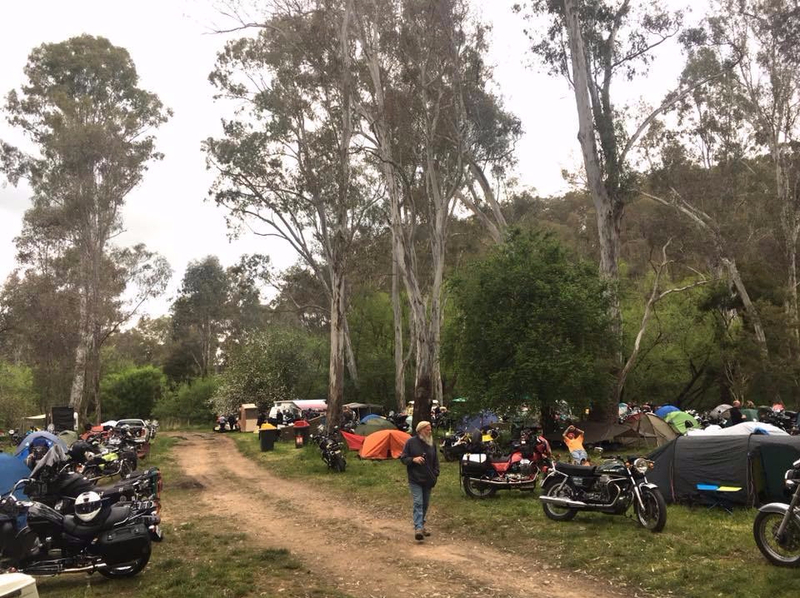 The Moto Guzzi Club of Victoria arranged a weekend run into western Victoria to visit the Quoin Hill Winery and the Dalwhinnie Winery – both owned by club members. 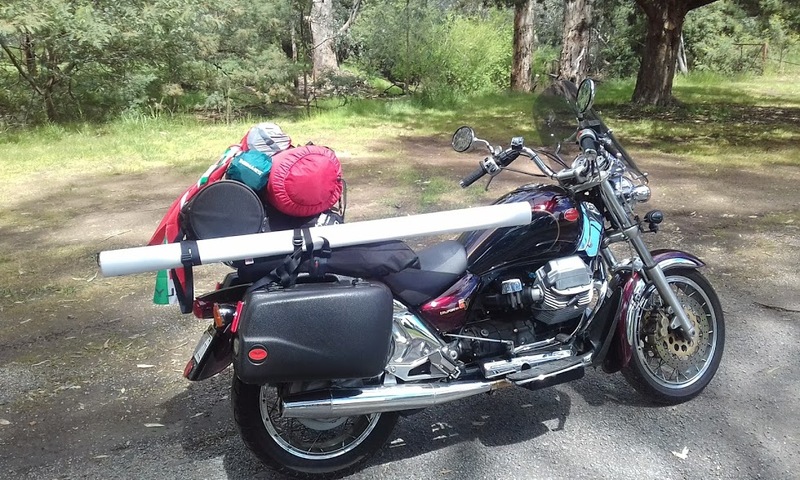 I decided to cut across the top of Victoria, via Shepparton, Elmore, Raywood, Bridgewater and Logan to overnight at St Arnaud. By luck, I found La Cochon Rose motel in the centre of town. Access to the motel units out the back was by riding though the old carriage archway. So the Guzzi was parked off-street and out of sight. And I was close to the pubs and restaurants. 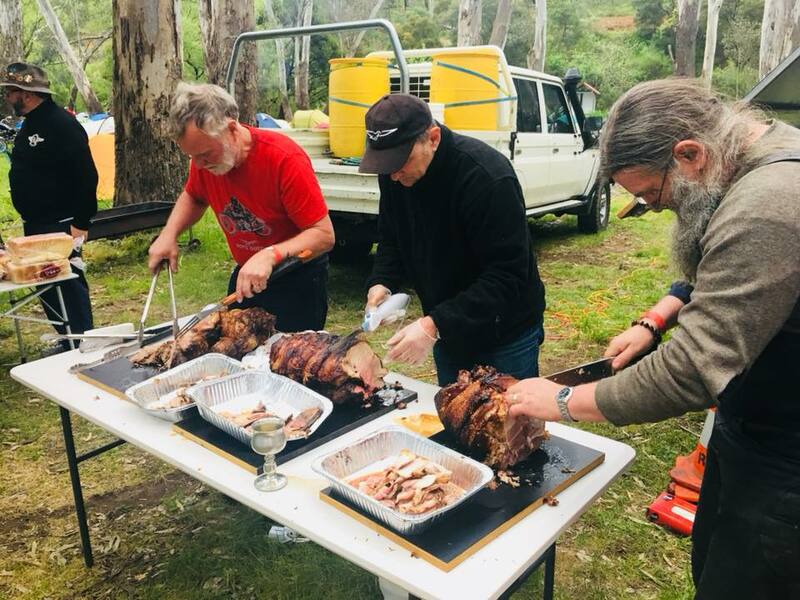 The next morning, I moseyed down through Avoca – had a coffee – and onto Quoin Hill Winery at Waubra. The rest of the club arrived soon after for lunch. …before returning to our overnight stay, the Moonambel Resort Hotel. Stuart had us all sorted out with rooms and bike parking. A shower, or swim, and we were ferried back up to the winery for a BBQ and tasting session. To beat the forecast heat, I was on the road at 8.30am for the 400km run home, keeping an eye out for bloody kangaroos. About 1000km for the weekend on the Breva 1100. She’s 10 years old, now, and running like a champ. 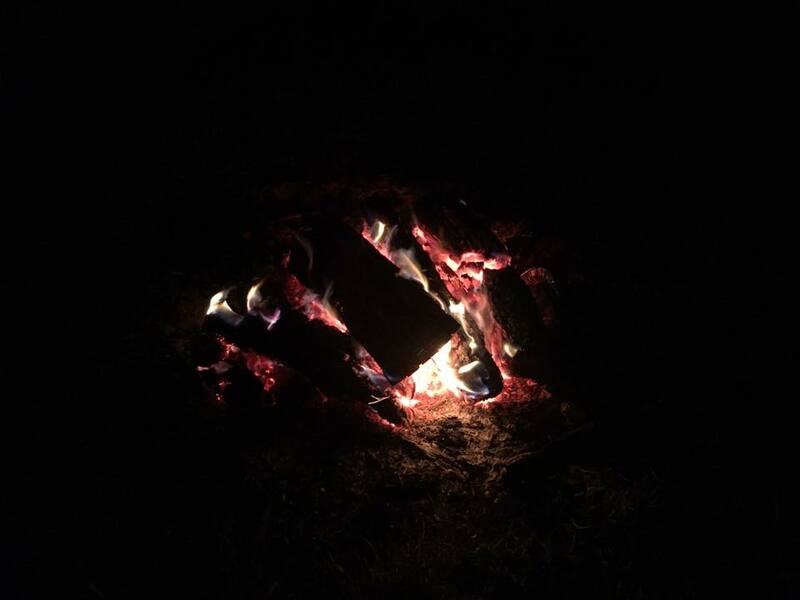 Living in north-east Victoria, one is never far from historic locations associated with Ned Kelly and the gold rushes -the so-called “Kelly Country”. So I fanged my Guzzi California EV down the roads to Greta, the one-time location of the Kelly family home. Greta is not far from Glenrowan, the site of the famous siege and use of armour. Ned Kelly was hanged at Old Melbourne Gaol in 1880 and buried in the yard. In 2011, his and other executed prisoners remains were exhumed and Kelly’s were identified by matching mitochondrial DNA. His remains were returned to his descendants who granted him his final wish to be buried near his mother. The graves are unmarked to prevent looting by the idiots in our society. It’s sad that the graves of the men Kelly murdered are not as well known. 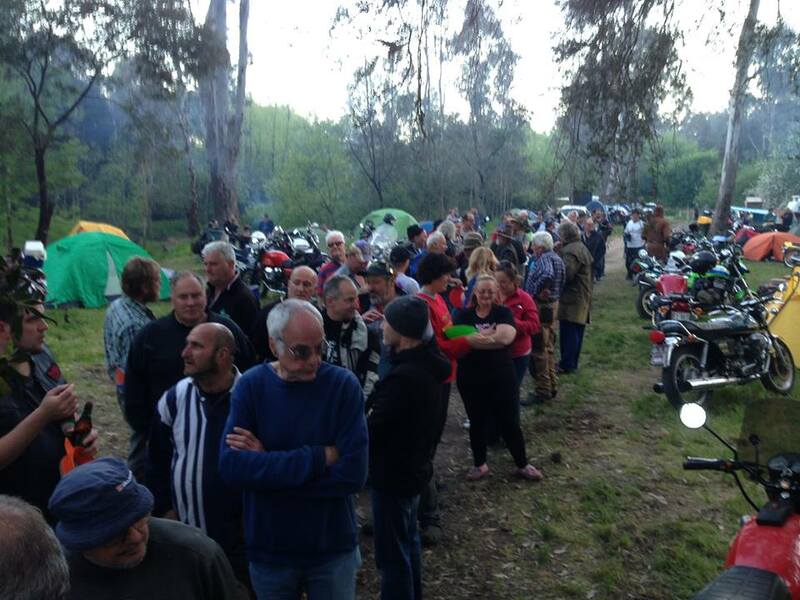 Spent four days at the Moto Guzzi Club of Victoria‘s annual Spaghetti Rally at Edi Cutting. The forecast was for fine weather after several weeks of heavy rain. 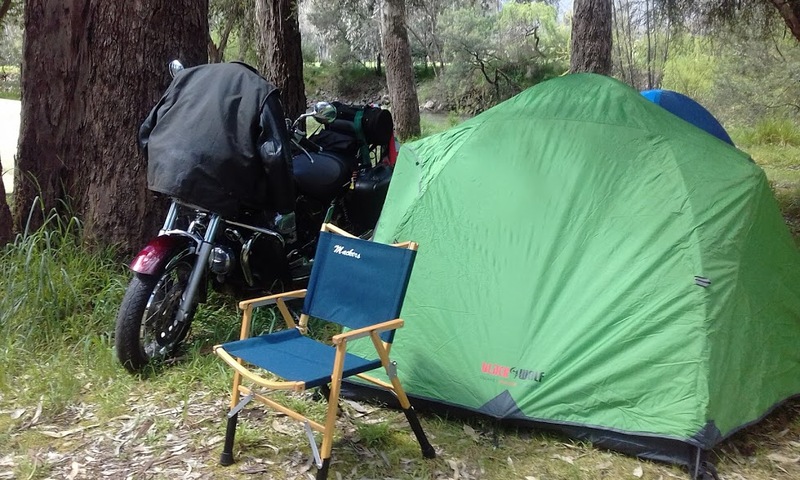 The King River had flooded a week or so earlier but the camp site had come up dry by the weekend. Arrived on Thursday to help set up with JFerg and Steve. 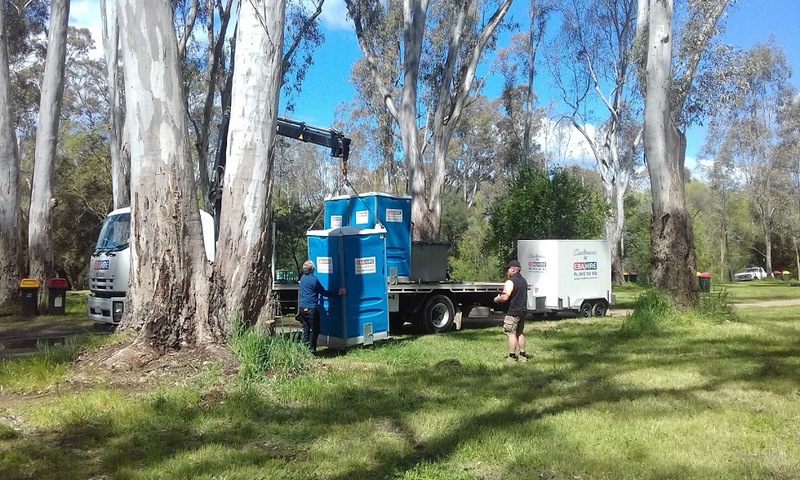 The cold storage trailer, firewood, rubbish skip and port-a-loos arrived. 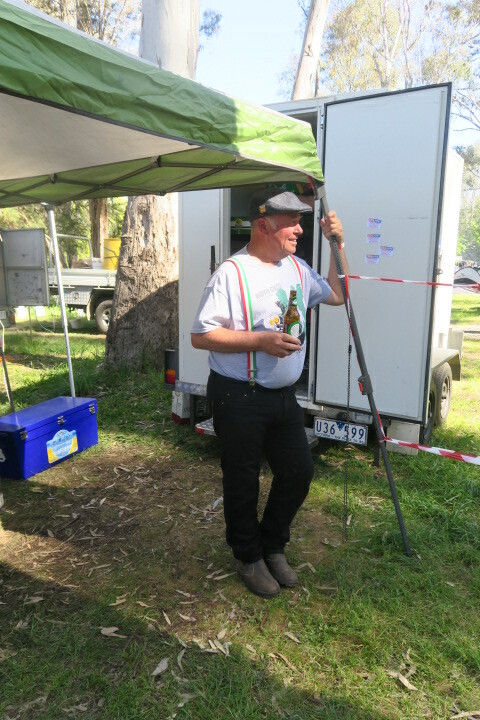 Went into Wangaratta on Friday morning with Ferg to buy the beer, bread, etc. By 1pm my Cali EV was still the only bike on site! 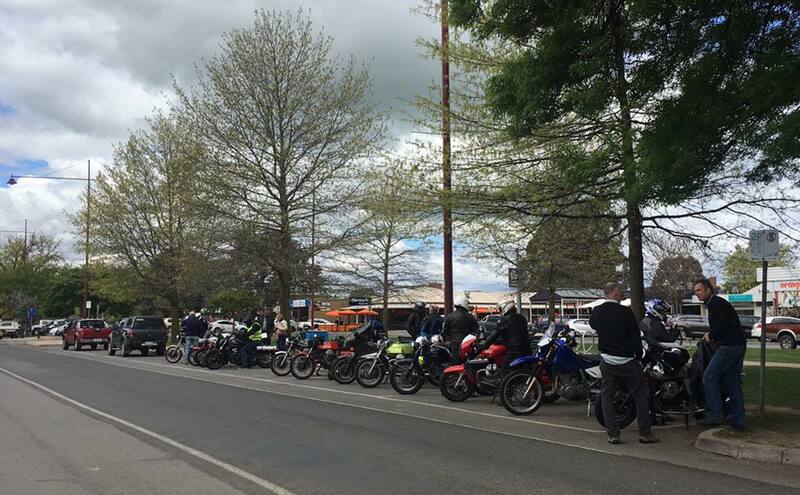 But then we were inundated and by evening about 80 rally-goers and their bikes had rolled in. Fridays have been getting progressively more popular. 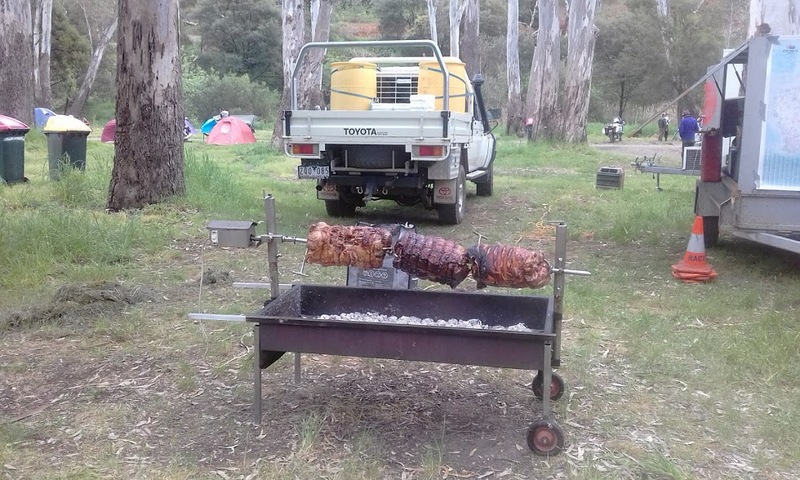 We put the spit roast on about 1.30pm, aiming for a 6-ish feed. It came out perfick! Bikes rolled in all Saturday, so we ended up with about 190 people. Riders came from Brisbane, Adelaide and Sydney. Saturday night clipped along and the bar was kept busy. We make a profit on the beer sales, but it’s sold at a price much cheaper than the pubs. 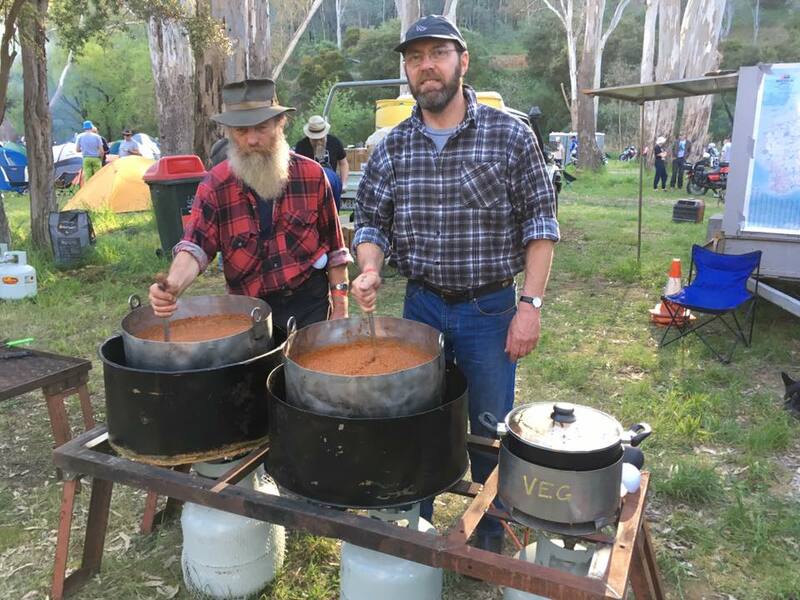 The spaghetti sauce, which the club had made on a Saturday “Bol-a-thon” a month or so earlier, kept everyone fed. 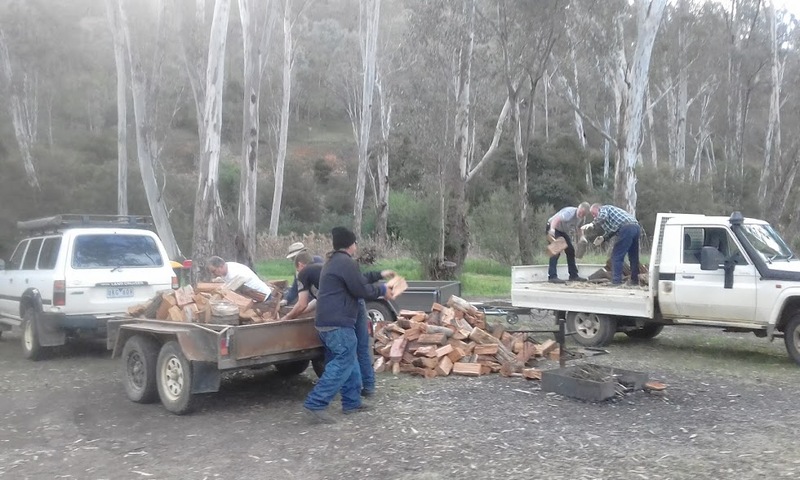 The local scouts rolled up on Saturday and Sunday mornings and sold bacon and egg rolls for brekky. The campsite cleared Sunday morning and I hung around to help with the clear up. Home early Sunday arvo. I’ve been keeping an eye on an oil leak. Looks like the seal at the rear of the gearbox is leaking. I’ll drop the bike into the local Guzzi dealer, Blacklocks, in Albury.